Heat oven to 350°F. Line bottom of 13x9-inch pan with foil; spray with cooking spray. In large bowl, stir cookie mix, butter and egg until soft dough forms. Press dough in bottom of pan. Bake 10 minutes. 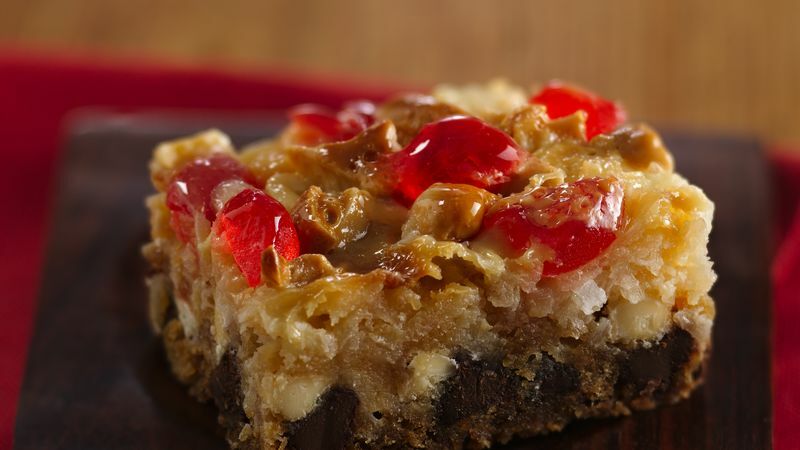 Sprinkle baking chips, coconut, cherries and cashews evenly over partially baked crust. Pour condensed milk evenly over mixture. Bake 25 to 35 minutes longer or until light golden brown, covering edges with strips of foil if necessary to prevent excessive browning. Cool completely, about 1 hour. For bars, cut into 6 rows by 6 rows. Special Touch Super-rich bars can be cut into mini squares and placed in decorative paper liners for serving.